I'd like to create my own iBeacon with some bluetooth low energy dev kits. Apple has yet to release a specification for iBeacons, however a few hardware developers have reverse Engineered the iBeacon from the AirLocate Sample code and started selling iBeacon dev kits. 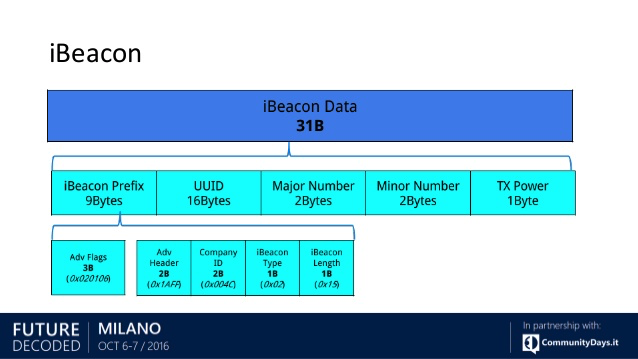 So what is the iBeacon Bluetooth Profile? Bluetooth Low Energy uses GATT for LE profile service discovery. So I think we need to know the Attribute Handle, Attribute Type, Attribute Value, and maybe the Attribute Permissions of the iBeacon attribute. So for an iBeacon with a UUID of E2C56DB5-DFFB-48D2-B060-D0F5A71096E0 a major value of 1 and a minor value of 1 what would the Bluetooth GATT profile service be? Heres some assumptions I've made from the discussion on Apple's forums and through the docs. You only need to see the profile service (GATT) of a Bluetooth peripheral to know it is an iBeacon. This blog has full details about the reverse engineering process. I have this node.js script working on Linux with the sample AirLocate app example. 1a # read as b00011010. # and simultaneous BR/EDR but this may vary by device! Missing from the AD is a Service  definition. I think the iBeacon protocol itself has no relationship to the GATT and standard service discovery. If you download RedBearLab's iBeacon program, you'll see that they happen to use the GATT for configuring the advertisement parameters, but this seems to be specific to their implementation, and not part of the spec. The AirLocate program doesn't seem to use the GATT for configuration, for instance, according to LightBlue and or other similar programs I tried. See this answer for more information. Not the answer you're looking for? Browse other questions tagged ios bluetooth bluetooth-lowenergy reverse-engineering ibeacon or ask your own question. Is this the correct layout to detect iBeacons with AltBeacon's Android Beacon Library? Can RaspberryPi with BLE Dongle detect iBeacons? iOS iBeacon: How to get all of proximityUUID programmatically? iOS + nRF51822 = iBeacon? Can I check the remaining battery of Beacon? iBeacon identifier value -why its not working? Does Android Lollipop 5.0 have Major Minor specification for Bluetooth Low Energy technology? Android - How to display properly a list of beacons?